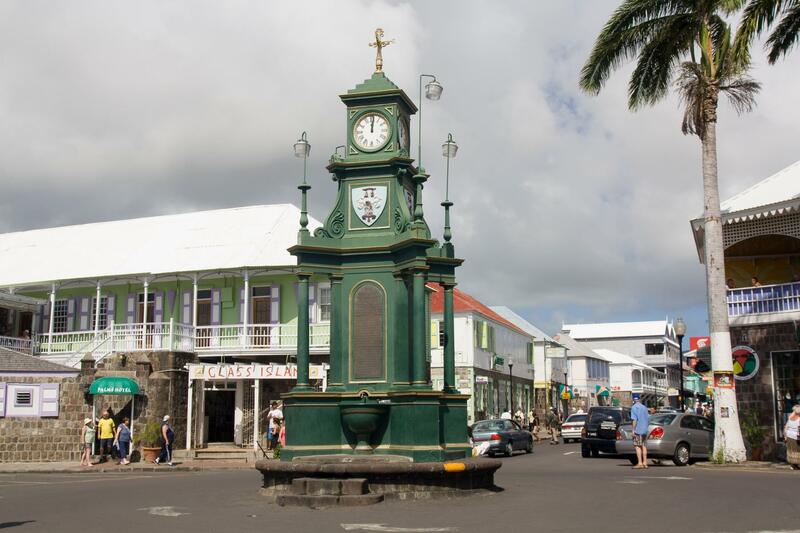 Thomas Berkley Memorial also known as the Circus Clock in the middle of downtown Basseterre, St. Kitts. St. Kitts, the larger of the two islands, is 23 miles long and 5 miles across at its widest, encompassing an area of 68 square miles and is roughly oval in shape except for a long, narrow peninsula to the southeast. Its highest point is a dormant volcano Mount Liamuiga (3,792 ft [1,156 m]). The Narrows, a 2-mile- (3-km-) wide channel, separates the two islands. The circularly shaped Nevis is approximately 7 miles in diameter, covering a total of 36 square miles and is almost entirely a single mountain, Nevis Peak (3,232 ft [985 m]), also a dormant volcano. The two islands support a population of about 50,000, of whom about 9,000 live on the island of Nevis. 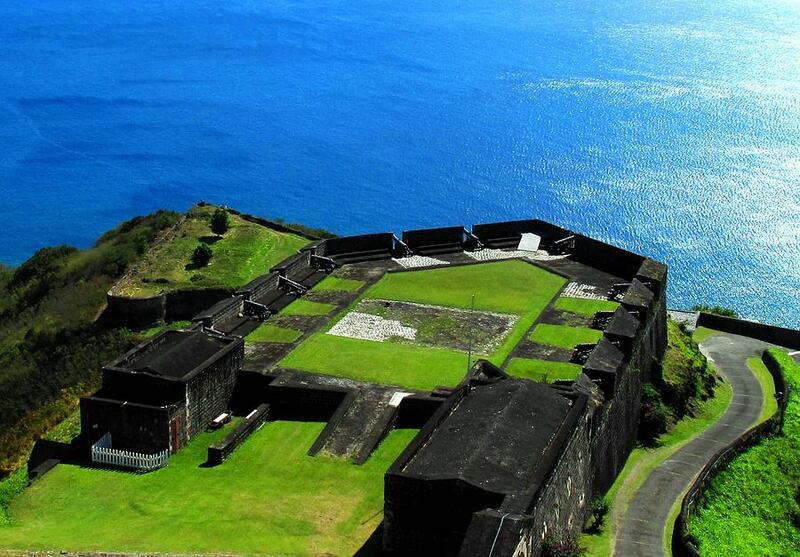 Brimstone Hill Fortress National Park, St. Kitts. As discovered by Christopher Columbus in 1493, the islands were home to native Carib Indians who called the islands Liamuiga and Oualie. Today, most of the inhabitants are the descendants of African slaves. The British settled on St. Kitts in 1623, and on Nevis in 1628. The French settled on St. Kitts in 1627, and an Anglo-French rivalry lasted for more than 100 years. After a decisive British victory over the French at Brimstone Hill in 1782, the islands came under permanent British control. St. Kitts and Nevis gained independence on September 19, 1983. A drop in world sugar prices hurt the nation’s economy through the mid-1980s, and the government sought to reduce the islands’ dependence on sugar production and to diversify the economy, promoting . tourism and financial servicesIn 2005 the government officially closed the 400 year old sugar industry. Although the capital of Nevis is Charlestown, the capital city and headquarters of government for the federated state is Basseterre on the larger island of Saint Kitts. A parliamentary democracy based on the Westminster model, St. Kitts and Nevis is the financial hub of the Eastern Caribbean, being home to the region’s major financial institutions. St. Kitts and Nevis enjoys full membership in the OECS, CARICOM, the OAS, the British Commonwealth and the United Nations.